Rosa Sifu - Si Pencinta Bunga Mawar: FLORIA 2011 - It's today! So, I would like to share some info about FLORIA and our MRS event with you. 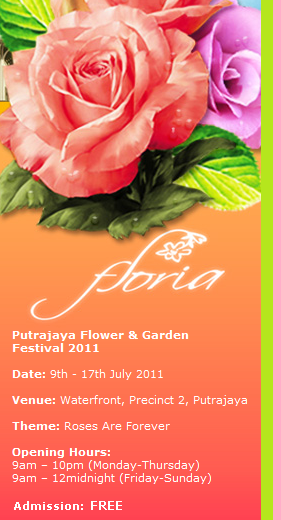 The FLORIA is commencing today on 9 July and continues until 15 July 2011. If you are interested to join the MRS event (and of course meet other rose lovers), please feel free to crash the party. We will having VIPs from Perbadanan Putrajaya with us at the event, so join along! The more the merrier. If you are there and wanna join in, just give me a call at 012-607 2757. We are all glad to have you join in. If you can't make it today; please make yourself free and grab the opportunity to head out to other workshops held by the Organiser. We do know that rose culture and rose education in Malaysia is still in infancy stage. So grab this opportunity to educate yourself. This kind of workshops are rare and admission is FREE. I list only ones on roses but you should check out the FLORIA official web site for full activities. You can't miss the many other interesting workshops too - like orchids workshop for example. In addition to workshops, they have activities for kids, local artists performing, wayang kulit show, fire eaters show, dances, floral boat parade and many other wonderful things. It is an event for the whole family basically. Known as "Sakura 1" locally. It has that same look like Peach Blossom rose. Whatever the name is, this rose is sought after by many for its many wonderful traits. Only one nursery carries it at FLORIA. This rose comes in two colors - pink and yellow. Both are gorgeous! I don't have a better picture so this doesn't do justice to the rose. not just at the very end of the branch, much like a sakura. The entire branch can be covered with flowers. 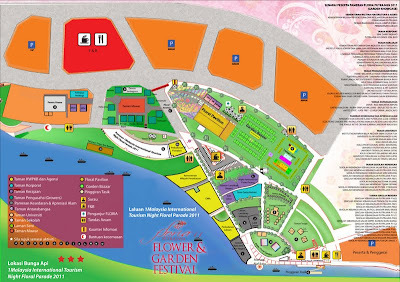 Be there in FLORIA and witness roses displayed in floral carpet, flower beds and in booths. There are more than 100 kinds of roses displayed from floribunda, hybrid tea, climbing and many more. Altogether there are around 400 kinds of flowers including roses displayed. Now is the chance to browse through the largest collection of roses in the country and get the right rose for you. Lastly, do find us "Malaysian Rose Society" on Facebook and be part of nicest people on earth.